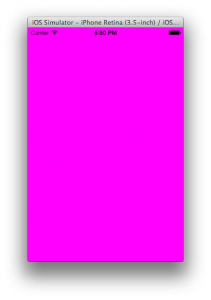 We finished Part 2 with the most basic drawing of all: we filled the screen with a background colour (pink/magenta), but no 3D objects. NB: if you’re reading this on AltDevBlog, the code-formatter is currently broken on the server. Until the ADB server is fixed, I recommend reading this (identical) post over at T-Machine.org, where the code-formatting is much better. If you’ve done any 2D geometry or Maths, you probably think of a “vertex” as “the corner of an object”. OpenGL defines “vertex” differently, in a more abstract (and powerful) way. Imagine a cube. If it were merely “a collection of points in space” it would have no colour. And no texture. Technically, it wouldn’t even have visible edges joining the points together (I drew them here to make it obvious it’s a cube). In practice … 3D objects are a collection of labelled items, where each item has multiple “pieces of information, usually a different value for each one”. One of those “pieces of information” is the 3D location (x,y,z) of the “labelled item”. Another piece of information is “what colour should the pixel be here?”. You can have arbitrarily many “pieces of information”. They could be the same for all the items in an object, or all be different. OpenGL Vertex: A point in space that has no particular position, and isn’t drawn itself, but instead has a LIST of tags/values attached to it. Your shaders take a set of vertices and render “something” using the information attached to the vertices. 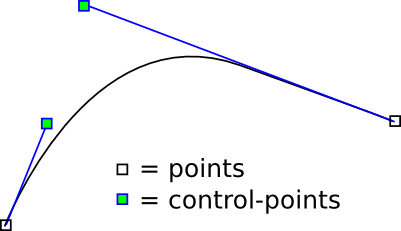 It has two ordinary points (a start point, and an end point), and two “control points”. The control points aren’t drawn as part of the curve, but you have to know their positions in order to draw the curve. Likewise, OpenGL vertices: they are more than just “corners”, they are meta-data about the object itself. And … OpenGL is able to “fill the space between vertices”, without drawing the vertices themselves. Gotcha: This is modern OpenGL; old OpenGL was a bit more prescriptive, and didn’t allow so much freedom. There is still one part of OpenGL that’s a hangover from those days: each vertex has to be given a position sooner or later, and if that position is “off the edge of the screen”, it will be PARTIALLY ignored by the renderer. 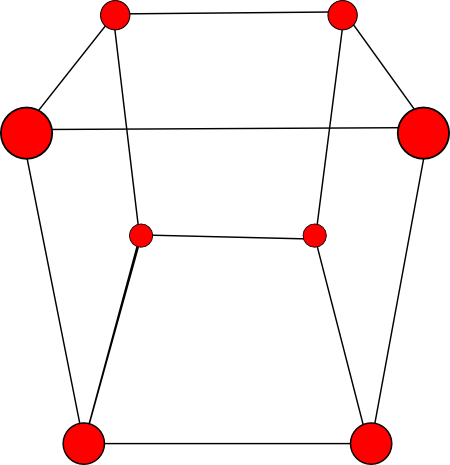 How many vertices for an object? Vertex shaders “do stuff with vertices” (plural of vertex). Hence the name. They can work in 1D, 2D, 3D, or 4D. Most of the time, they work in 3D or 4D, but their output is usually in 4D. If you’re working in 3D, there’s an automatic “up-conversion” to 4D that happens for you, so you never need to understand the 4D part – except that: a lot of your variables will be of type “4D vector”. With later versions of GL (not GL ES 2!) there are techniques that use this to do all your rendering without any vertices at all. But ES 2 runs your code “once per vertex you uploaded”, so unless you upload some vertices … your code won’t run at all. …runs your source code once to calculate a 4D point. By default, where does a particular 3D point appear on screen when OpenGL draws it? When you write a 3D engine, you almost never use the OpenGL default co-ordinate system. But when you’re starting out, you want to debug step-by-step, and need to know the defaults. 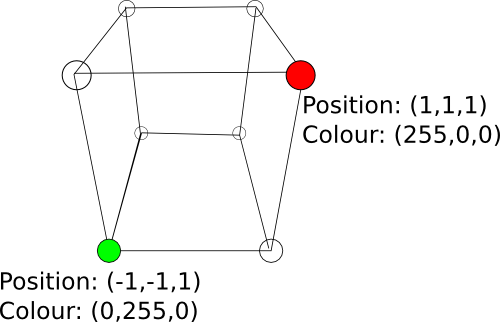 It’s slightly more complex than “throw away all points”, but with simple examples and test cases, you should make sure all your 3D co-ordinates lie within the cube with width = 2, centered on the origin (i.e all co-ords are between -1 and +1). Pixel shaders turn 3D points (NOT vertices – but the things created from vertices) into pixels on screen. A Pixel Shader always uses the output of a Vertex Shader as its input; it receives both “the 3D point” from the Vertex Shader, and also any extra calculations the Vertex Shader did. Technically, OpenGL names them “Fragment” shaders. From here on that’s what I’ll call them. But I find it’s easier to understand if you think of them as “pixel” shaders at first. An alternative view: just as an OpenGL “vertex” isn’t quite the same as traditional “points” in geometry, an OpenGL “fragment” isn’t quite the same as a monitor’s/screen’s “pixel”. A Fragment often has an Alpha/transparency value (impossible with a screen pixel! ), and might not be a colour (when you get into advanced shader-programming); also … it might have more than one value associated with it (it retains some of the metadata that came from the Vertex). Any Fragment Shader can have a pixel colored any colour that it wants so long as it is Blue. Black would work fine too, but … in OpenGL examples, we never use the colour black. Black (and white) are reserved for “OpenGL failed internally (usually because you gave it invalid parameters”. If you use black as a colour in your app it’s very hard to know if it’s working correctly or not. Use black/white only when you’re sure your code is working correctly. In OpenGL, remember that you can and should use multiple draw-calls when rendering each “frame”. Ignore the people who tell you that iOS/mobile can’t handle multiple draw-calls; they’re using long-outdated info, or unambitious graphics routines. Modern OpenGL’s real power and awesomeness kicks-in when you have hundreds of draw calls per frame. …if it has unexpected effects, it’s easy to toggle it on/off at runtime while you debug it. Check the screen now fills to the new colour. Note that the “alpha” part is ignored. Alpha generally kills hardware performance of all known GPUs, so you just have to accept it needs “special” handling at the API level. By default, alpha will often be ignored by the hardware until you explicitly enable it (to ensure that the default rendering performance is good). It’s time for GLKit to start helping in a bigger way. OpenGL has an internal concept of “3D position”, but only on the GPU (i.e. in Shaders). On the CPU, where we have to create (or load) the 3D positions in the first place, OpenGL doesn’t have a vector/vertex/point type. This is a little absurd. I don’t know the full reasons, but it’s partly historical: early desktop OpenGL, being a C API, worked in the lowest-level data it could: everything was a float or an int. A 3D point was “3 floats in a row, one after the other, in memory”. OpenGL could “get away with” not defining a type for “3D point” etc. With C, every platform was free to add their own version of “3d point type” so long as it was implemented on top of 3 x float. Shaders were added 10 years later, and with their custom programming language (GLSL) they needed … some kind of type … to represent this. Hence we got the standard of vec2 / vec3 / vec4, and mat2 / mat3 / mat4. But OpenGL’s authors don’t like going back and altering existing API calls, so the “old” API’s, which only understand float (or int, etc), are still with us. We want to create the geometry “only once, but every time we re-initialize the ViewController (re-start OpenGL)”. Your ViewController’s viewDidLoad is fine for now. Note that “GLKVector3 cpuBuffer” is the same thing as “GLKVector3* cpuBuffer”, and that we could have malloc’d and free’d the array manually. But on the CPU, we won’t need this data again – as soon as it’s uploaded to GPU, it’ll be thrown away on the CPU. So we do a local array declaration that will be automatically cleaned-up/released when the current method ends. Your shaders are code that runs 100% on GPU. The points/vertices are data you create on the CPU, then upload to the GPU. It turns out that transferring vertex-data from CPU to GPU is one of the top 3 biggest performance sinks in OpenGL (probably the biggest is: sending a texture from CPU to GPU). So, OpenGL has a special mechanism that breaks the core GL mindset, and lets you “cache” this data on the GPU. Early OpenGL has a convention for “uploading data to the GPU”. You might expect a method named “glUploadData[something]” that takes an array of floats, but no, sorry. A BufferObject is a something that lives on the GPU, and appears to your CPU code as an int “name” that lets you interact with it. You can “create” these objects, you can “upload” to them (and in later versions of GL: download from them), you can “select” which one you’re using for a given Draw call, “delete” them, etc. Each Draw call can read from multiple BufferObjects simultaneously, to grab the vertex-data it needs. Each 3D object will need one or more VBO’s. When we do a Draw call, before drawing … we’ll have to “select” the set of VBO’s for the object we want to draw. called “draw” and said you wanted the 3 vertices interpreted as a “triangle”. It appears OpenGL is “drawing nothing”. In old-fashioned GL, this wouldn’t happen. Instead, it would have drawn your object in solid black. If you’d set a colour to black, it would seem to be working. If you’d set a black background, it would seem broken (see what I mean? never use black when debugging…). VertexPositionUnprojected.vsh … make a new file for this! Compiling is simple, but uses non-standard approach in OpenGL. OpenGL does retain/release management of Shaders and ShaderPrograms. This is unique in OpenGL (part of the “OpenGL committee screwed the pooch when adding Shaders” problem). To make life easy, our GLK2ShaderProgram class matches the ObjC retain/release to doing the same in OpenGL, so we don’t have to worry about it. We also override the setFragmentShader: / setVertexShader: setters so that they use glAttachShader and glDetachShader as required. This is part of the retain/release management – again: needs doing once ever, and never worry about it afterwards. …but again, we wrap it in an instance method (“link”) which adds some checks before and after, and automatically detaches/deletes the unused Shader objects if the linking fails. Finally, with all that Shader/ShaderProgram code written … we can compile and link the shaders, and upload them to the GPU. Now that a Draw call can have a ShaderProgram, our render method needs to make use of this. Going forwards, every time you add a new “OpenGL feature” to your code, you will do “if( drawcall uses it ) … do it … else … disable it”. If you don’t, OpenGL will start to “leak” settings between your draw-calls; most leaks are cosmetic (the wrong stuff appear on scren), but in extreme cases then can crash the renderer. What’s happened is that Apple has turned your shader file into a “source” file, and removed it from your project (you don’t want source files appearing in your shipping binary / .ipa file!). You have to go into “Project Settings > Build Phases”, find the file inside “Source files”, and drag it out of there and into “Resource files” / “Files to be copied”. This is a bug in Xcode 4, pretty embarassing IMHO. Apple always converts shader files into “unusable” source files, and then promptly removes them from your project’s output. I haven’t found a way to prevent it doing this. Every time you make a new shader, you have to manually “unbreak” your xcode project. Only once per file, fortunately, but it’s a huge annoyance that Apple didn’t notice and fix this. ARGH! It appears that OpenGL is still “drawing nothing”! Why? OpenGL can clearly see that you’ve uploaded a whole load of GLfloat values, and that you’ve got exactly the right number of them to use “1 per attribute in the shader, and 1 per vertex we told GL to draw” … but it plays dumb, and refuses to simply “use them”. Instead, it waits for us to give it permission to use THOSE floats as the ACTUAL floats that map to the “attribute” we named “[whatever]” (in this case, we named it “position”, but we could have called it anything at all). In desktop GL, this mucking around has been improved (a little) – you can put the mapping into your Shader source files – but that’s not allowed in GL ES yet. …but ignore that one for now. It’s included in the class because you can’t read the other data for an ‘attribute’ in OpenGL without also reading this, but we have no use for it here. free( nextAttributeName ); // important: in C, memory-managing of strings is clunky. Leaking this here would be a tiny, tiny leak, so small you’d never notice. But that’s no excuse to write bad source code. So we do it the right way: “free” the thing we “malloc”-ed. That’s great, now OpenGL is saving the list of attributes. There’s an NSLog warning in the middle there – we’re going to ignore glBindAttribLocation for now. Personally, in real apps, I prefer to use glBindAttribLocation (it makes life easier to experiment with different shaders at runtime), but you don’t need it yet, and it requires more code. …which enables us to tell OpenGL ‘THIS attribute is stored in the uploaded data like THAT’. But there are two parts to this. If we simply “tell” OpenGL this information, it will immediately forget it, and if we try to render a different object (in a different Draw call), the mapping will get over-written. Obviously, the sensible thing to do would be to attach this metadata about the “contents” of a BufferObject / VBO to the VBO itself. OpenGL took a different path (for historical reasons, again), and invented a new GPU-side “object” whose purpose is to store the metadata for one or more VBO’s. This is the VertexArrayObject, or VAO. It’s not an Array, and it’s not a modern Object, nor does it contain Vertices. But … it is a GPU-side thing (or “object”) that holds the state for an array-of-vertices. It’s a clunky name, but you get used to it. After you’ve finished storing the VBO’s state/settings/mapping-to-VertexShader-attributes in the VAO … you can de-select the VAO so that any later calls don’t accidentally overwrite the stored state. In standard OpenGL style, deselection is done by “binding” (glBindVertexArrayOES) the number “0″. We won’t do this here because it’s unnecessary, but lots of tutorials will do it as a precaution against typos elsewhere in the app. 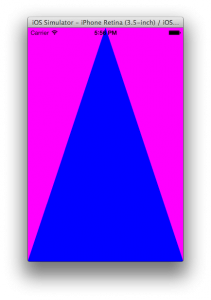 You can turn the background-clear on and off for the new Draw call, and see that without it, the triangle appears on the old magenta background, and with it, it appears on the new green background. In this post, we’ve added three new classes to the project. No need to type them all out yourself. GitHub link to a commit that has this exact version of the full project (I’ll update this link if I make a new commit with changes/fixes). What will be next? I think it has to be … texture-mapping!